Entaco enjoys a fairly new clubhouse, built by its members in 2005 and overlooking the green. Facilities include a fully equipped kitchen, changing rooms, toilets including a disabled toilet and a licensed bar. 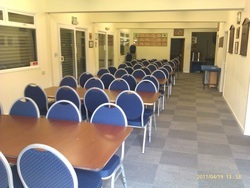 We can cater for up to 70 people for tea & biscuits, buffet or hot meals. In 2013 we gained a 5 star hygiene rating from SONA Environmental Health Dept. We have about 70 active members most seasons. Some play in just the Tuesday afternoon and Thursday evening roll up games while others play in the 40+ friendly matches. These matches are both home and away events against local clubs, in Warwickshire & Worcestershire, being either Mens, Ladies or Mixed matches. We also run club competitions throughout the season leading up to a finals day at the end of the season. We have teams in the local INTERBERGA & REDDITCH Triples leagues. ​The more ambitious players can take part in Warwickshire, South Warwickshire, County and National competitions. We hold a number of social events including a Horse Race evening and a Skittles evening. We have one of the best greens in the county and play host to a number of county games during the season. All members take part in fund raising efforts throughout the year. By this means we are able to keep subscription fees under control and make year on year improvements to club facilities. We welcome new members..if you are interested in bowling why not pay us a visit or give us a call? We are a self funding Community Amateur Sports Club where monies from fund raising play a large part in our continued existence, for the benefit of members and the local community. Donations are most welcome and will be used on improvements for the benefit of all. CASC is a Government funded scheme that provides clubs with extra funding that can be reinvested in improving facilities. CASC registered clubs, by definition, have to be open to all, with reasonable membership fees, ensure greater opportunities for participation and thus can enhance funding applications by the use of the Gift Aid route. It is often possible to utilise Gift Aid when clubs are organising their fundraising events throughout the year and indeed when setting subscription levels. Sponsorship of members who raise funds for the club by way of participating in activities, or other fund raising, may qualify in full for Gift Aid.